There are as many different ways to approach reading S. as there are unique readers out there to consume the book. No two people are going to work their way through S. in the same manner. Conceived by J.J. Abrams and written by Doug Dorst, S. is a wholly immersive new publishing venture that is sure to please anyone who loves books. You don’t so much read S. as you experience S., and that is what makes it so distinctive. S. is comprised of two main stories – there is the novel itself (called Ship of Theseus) and then there are the margin notes which document a conversation between two scholars over a period of time. To read Ship of Theseus straight through while ignoring the margin notes. Then come back to the beginning and read the marginalia in written order. 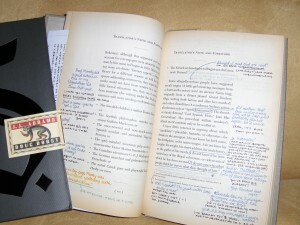 Read Ship of Theseus and margin notes at the same time in the order they appear on the page. Read Ship of Theseus. Then come back to the beginning and read the marginalia through multiple times, each time focusing on only one set of margin notes (which represent one pass through the book). Since the margin notes are written in different colors for different time periods, this would be easier to do than it might sound. When I sat down with my copy of S., I went in planning to follow option 1. But as I began to read, I found that the marginalia were so intriguing that there was really no way to ignore it and so I ended up proceeding more in line with option 2. It would not be a stretch to say that I found Jen and Eric (the characters writing in the margins) and their evolving relationship to be the most compelling aspect of the reading experience. Ship of Theseus is, by design, more of an allegorical story and because of this is not quite as gripping. There is also the added element of the footnotes that appear throughout Ship of Theseus. The footnotes are where the majority of the puzzles one would expect to find in a J.J. Abrams project appear, but this is not to say that there are not puzzles in other locations; I can promise you they are there even if they are not immediately apparent to the reader. It would be impossible to discuss S. without looking at the larger overarching themes that run through the work – themes like identity, ownership, loyalty, and scholarship. The concept of identity is probably the central concern of the work. Much of the dialogue between Jen and Eric concerns uncovering the true identity of Ship of Theseus author V.M. Straka, but there are much more philosophical discussions of identity going on just under the surface as well. How do the events in our lives work to change who we are? How can we become “a self rewritten from a lost first draft” (pg. 126)? The classical paradox of the Ship of Theseus also plays its part in the novel. While those interested can look more into the history of the paradox, this philosophical debate basically looks at the concept of identity from this vantage point: If a ship leaves port on a long journey and during that trip various parts of the ship are replaced as they wear out such that by the time the ship reaches its destination, all parts of the ship have been replaced, is it still the same ship? How this paradox relates to S. is a matter for individual readers to determine. For me, it ties in with the idea that the novel Ship of Theseus as presented in S. is a translated work (with translations provided by the fictional F.X. Caldeira). So, if a work is translated, is it essentially still the same piece of literature or is there “value-added” by the act of translation? As is common with all debates on topics of philosophy, there really are no answers provided and that is the one area I would caution readers about. If you are the type that prefers a straight-forward plot, dynamic action and clear resolution in your books, S. is probably not the right novel for you. As J.J. Abrams does with his visual projects (take TV’s Lost as an example), he requires the audience to do much of the work in making connections and drawing conclusions. Reading S. can’t and isn’t intended to be a passive exercise. Readers will get more out of the experience relative to the amount they put into it. This idea is further enhanced by the multiple forms of ephemera included with the novel, everything from handwritten letters on various stationaries to a Mass Card to maps drawn on coffee shop napkins. External of the book itself, readers can also find websites, radio broadcasts, and contests related to S. bringing to the forefront this idea of a multimedia submersion in the mythos of V.M. Straka. At the end of the day, what I can say without a doubt is that reading S. will be unlike any other reading experience you have ever had. Love it or hate it, you are going to want to take this journey because history will look back on the publication of this book as one of the highlights during this tumultuous time in the industry. The physical object of the book itself is worthy of placing on a coffee table simply by virtue of the technical marvels involved in the actual printing of the book. But it is for the content, upon which we will ruminate for years to come, that we have J.J. Abrams, Doug Dorst and Mulholland Books to thank. They have brought S. into our plane of existence and it is now ours to relish forever. What an intriguing, well written review. This novel sounds like a total journey for the mind, as well as a feast for the eyes. And, as a graphic designer I just want to run out and get this book to experience the visual excitement. Kris, apt description of a book that likely offers levels of interpretation and response that are enormously enriching–well worth the initial frustration experienced by the traditional reader. I read Anne Carson’s “Nox” and found it powerfully engaging and emotional, because the delivery mechanism advanced the message. “S” sounds intriguing on a different subject–the puzzling nature of human relationships. Very excited. Bought two of these for my very different grown children… who love to read. Loved the reaction from Ben… holding the book and all its parts in hand, excitedly showing me some of the elements and quickly reading the first pg of dialogue… with his intrigued look asking: “How does one read this?”… Kris’s Review to the rescue! Yet still leaves it very much to each person’s reading style. I predict: My daughter will choose option 1 and do this reading methodically. Thanks Kris for motivating me to get these “projects” for my grown children to enjoy! DYING for this book …!